Anyone who keeps up with the latest technology news would agree with me that, while we enjoy the perks of connectivity and mobility, we have privacy problems. We are so swept away with the Internet of Things (IoT), big data, and trends that sometimes we are unaware of the data collected from our devices. Mobile devices and laptops now come with a location services feature. Once it’s activated, your vendor – whether it’s Microsoft, Blackberry, or Apple – can track your location and likewise the third-party apps you install. The good thing is that you can deactivate it if you don’t want to be tracked, and you’ll be saving more battery power too. 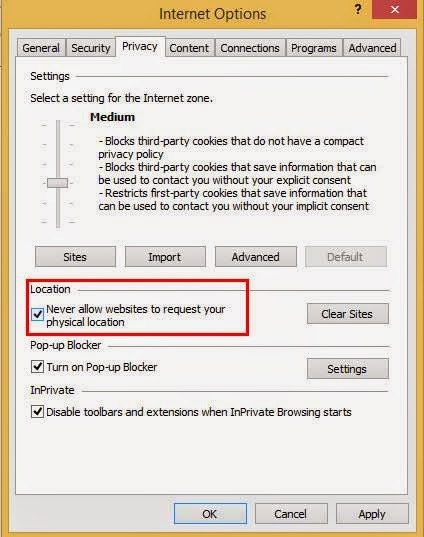 Here are the instructions for turning off location request on Windows 8. Windows 8, unlike Windows XP or Vista, comes with a built-in location-based function. Once activated, it will check your location regularly and provide the information to apps like Maps, Weather, Travel, Google Maps and other productivity and tracking apps. This feature is available on Windows 8-based tablets and notebooks, and if it’s not disabled, your whereabouts are sent to Microsoft servers. The initial Windows 8 setup prompts users to either allow the OS to activate this location-based information feature in its applications to find your location and scout useful data such as weather, stocks, latest news, etc., or to just disable it. If you’re concerned with privacy settings like me, or if you’re anxious about being snooped on, you might want to turn off the location-based function on your Windows 8 system. 1. On your keyboard, press the “Windows key + I” buttons. The Settings screen pops from the right side. 2. Select “Change PC Settings” found at the lower-right side of the screen. 3. 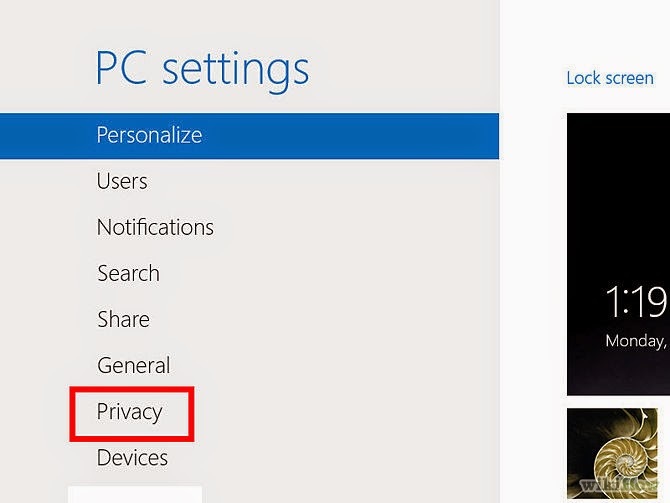 Under PC Settings, select “Privacy”. 4. Under Privacy, choose “Location”. 5. The default setting is Toggle ON, which permits the system and third-party apps to use your location. 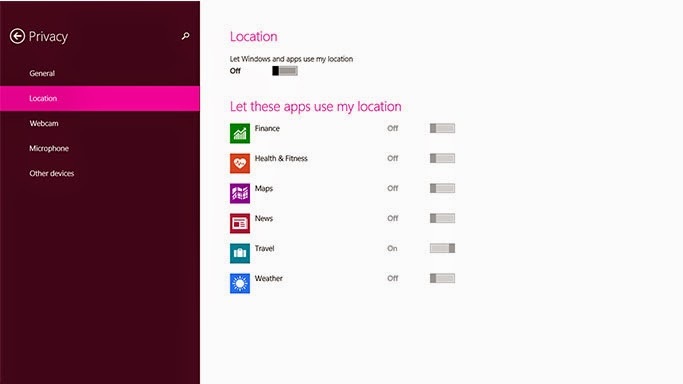 Toggle OFF to stop Windows 8 from snooping your location. Once you choose OFF, the apps below automatically follow the initial choice. 6. Tap the Windows key and go back to the dashboard. With the location tracking on apps and system now disabled, you can also deactivate the location permission in the default IE browser. 1. Launch the Internet Explorer and tap the gear icon at the upper right side to open the Tools. 2. Select Internet Options and choose Privacy tab. 3. Under the Location option, put a check on “Never allow websites to request your physical location” box. Note: Once you turn OFF the location service feature in the system and IE, you will get annoying pop-up permissions once in a while whenever you launch an app that requires this feature or when you visit the Google Maps website. If you click the Allow button, it will prompt the system to turn on the location service. If you’re after privacy and don’t want to be tracked whether on apps or the IE browser, just follow this tutorial and share it with your friends if you find it helpful. Let me know how it works for you.